Almost all four legged predators have certain biomechanical traits that natural selection consistently favors over other forms. That’s because those forms work better than other forms. Artificial selection isn’t limited to what forms work best; we can breed any poor twisted mutant we want and make a whole breed of them. This is why I’m following nature’s example when making decisions about the shapes and forms I select for in my breeding program. The first example is the underbite. A lot of people say this allows the dog breathe while holding. This one’s easy to dismiss because that’s why dog’s nostrils have slits on the sides – they breathe through the front and the sides. If this trait were needed, then every wolf would be in danger of suffocating before every meal. Protection dogs would have to let go to breathe every little while, but don’t. If it were an advantageous trait for a catch dog then some natural predator would have this adaptation to help them hunt, but every wild four legged predatory mammal has a scissor bite. What will hurt a dogs ability to breathe is an pug nose – this is on or off the bite. 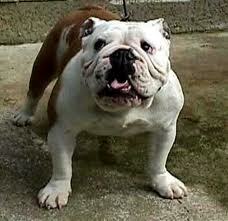 This is an english bulldog with a very short face. You can see how all the internal structures of the sinus and nasal cavity are pushed into a much smaller space, and the side nasal slits are blocked by the face. 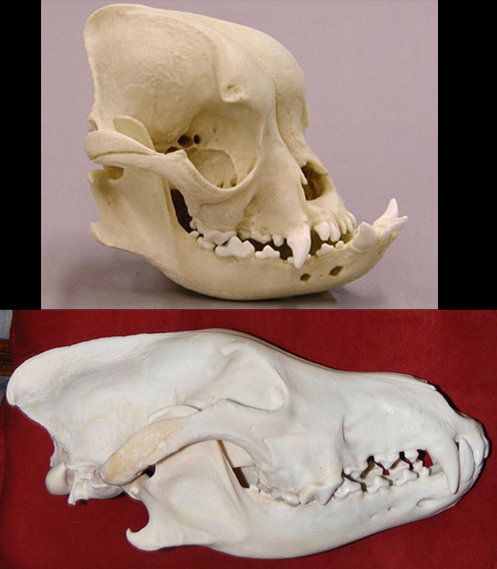 This is a picture of a bulldog skull compared to a wolf skull. You can see the wolf’s upper and lower canine teeth interlock to form a strong scissor bite. The bulldog’s upper and lower teeth are completely out of line, creating a useless underbite. There is a reason nothing in nature is built this way and airlines won’t ship pug-nosed dogs over a certain temperature. The next point is the “stop”. A dogs stop is the bridge of the nose where the brow and the muzzle meet. 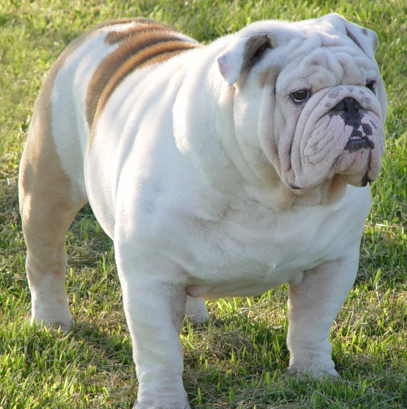 Some breeds like the corso, the boxer, and most of the bulldog faced breeds have pronounced stops that make sharp angles. Having this “kink” in the upper jaw is a weakness. Think of the way pliers and other structures that have to transmit force are shaped. The strait or curved outward shapes put more material in the parts that take the most force so they’re strong. In the case of a skull the stop amounts to an area lacking the bone to cleanly transmit force from the jaw muscles at the back of the skull to the front of the jaw. Wolves have almost no stop and have incredible jaw power. The big cats radically outclass the wolves in biting force and the have either no stops or the reverse with bone built up and over where the stop would be. Lions and big tigers have the most bite power of the big cats – this isn’t surprising considering they are the biggest of the cats. However, hyenas can bite harder than a much larger lion because the shape of their skulls allow for much more force to be applied without breaking the upper jaw. Again there is a reason nothing in nature has a stop. 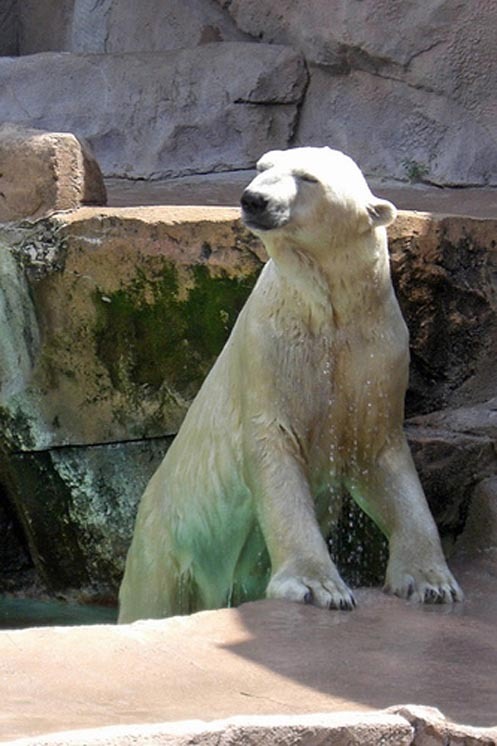 Some bears look like they have stops, but that is soft tissue on the face. 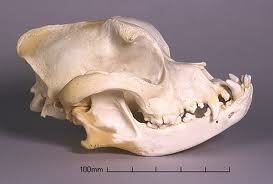 If you look at the skulls of bears they are very similar to the skulls of big cats. The upward arch on the upper jaw gives, the skull plenty of bone to support the pressure of the bite. 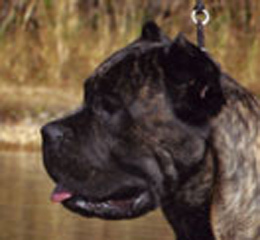 The stop amounts to a loss of bone on the upper jaw in the line from the jaw muscles on the head to the end of the muzzle. This limits the amount of force a dog can press down before risking breaking their own jaw. 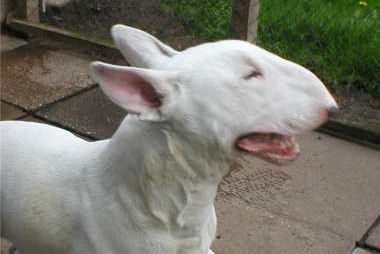 The original English Bull terrier skull would be ideal, but EBT are now bred for “downface” not a shallow stop. It’s easy to see why a “downface” is useless in protection work, the dog has to look up just to bite straight forward. The next point is the dogs that are overly wide for their height. 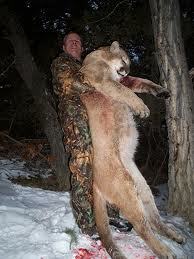 Again, no predator in nature is built this way. All 4 legged wild predators have about the same ratio of width to height. I have no problem with a thick dog as long as the width comes from muscle on the outside of a balanced frame, not the frame of a hippo with no muscle on it. Having a balanced frame allows a four legged animal to quickly maneuver with an easy stride. Even though these animals are from different species and from all over the world, they all depend on their catching ability to survive. As a result they are all built to move, like any protection dog should be. The obvious argument is “what about bears”. 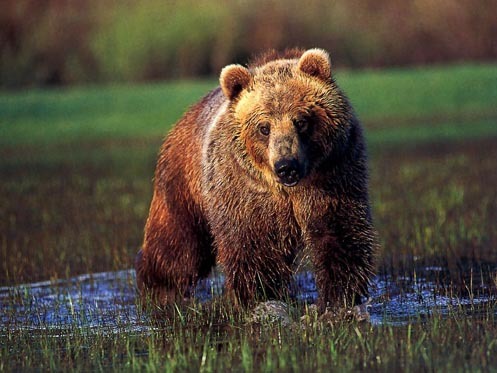 Bears aren’t as wide framed as they look because they carry a lot of muscle, fat and fur. The also have a much wider ribcage to make room for the extra digestive system an omnivore requires. 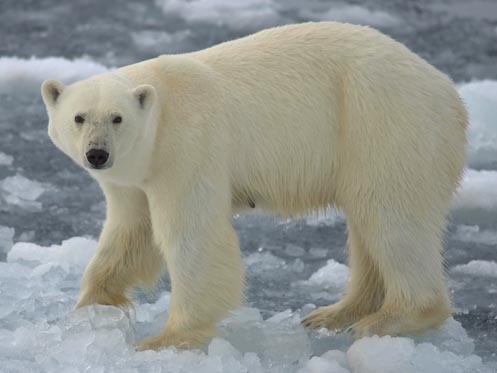 Being an omnivore makes them much less dependent on being able to catch prey. Though they are fast runners they are nothing like the big cats or wolves for catching. 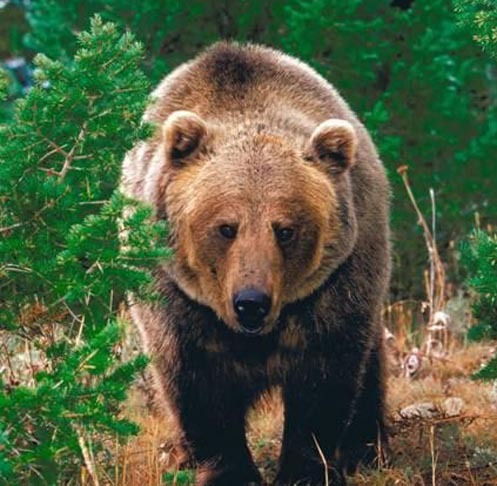 As you can see bears aren’t as wide chested and short-backed as we tend to think of them, though they are wider bodied than the more carnivorous canines and felines. This brings me to short backed dogs. Again natural predators all have about the same height the length ratio. This is a very critical point, this is a major factor in determining how easy and natural a double-suspension rotary gallop comes to a dog. 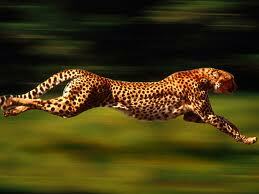 This gallop is a dog’s fastest gait, and is the same gait a cheetah uses to get to top speed. If the dog is too short backed or has too low a back end they bounce and don’t have the natural body dynamics that make the rotary gallop easy and efficient. This makes for a slower, less maneuverable runner with less wind. 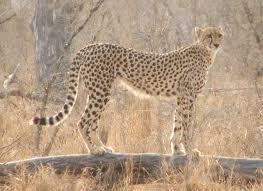 You can see cheetahs have long backs and high muscular back ends. When you compare that to fast efficient running dogs you see they have very similar builds. My fastest dog is Kronos, he cruises at 35 and peaks at 40 mph, not surprisingly he’s built like a great runner. A lot of people argue that a personal protection dog doesn’t need speed because they won’t be expected to run people down who are trying to get away. But they do need speed to cover the “shot gap” the moment from when they are spotted by the attacker to the moment they bite. The longer it takes them to cover that distance the more time the attacker has to try to shoot them. This is also why I like dark patterned dogs, reverse brindle, blue reverse brindle, and blue merle are very hard to see in the dark. This is also why I don’t like dog aggression. If you have a working pair of lightning fast dogs that are almost invisible in the dark . They are very hard to shoot down before getting bitten. The next issue is the size needed in a protection dog. Many people believe a protection dog shouldn’t be above 100 lbs, with the idea that big dogs are slower, have less endurance, and less maneuverability. This tends to be true because of the terrible state of the Mastiff breeds, but it isn’t an absolute truth. Consider the speed, maneuverability, and endurance of a 15 lb Pug compared to a 70 lb Greyhound. 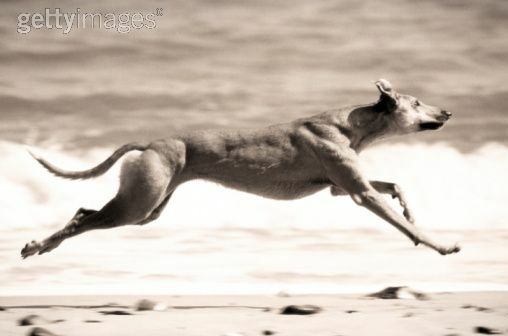 Even though the Greyhound can be 3 times the weight, his superior biomechanics allow him to easily outclass the pug on all counts of athleticism. Wolves and especially big cats can be far larger than 100 lbs, but can still run down, catch, and kill prey that are larger and faster than any man. It’s no stretch to imagine a well bred athletic mastiff of 150 – 170 lbs taking any man. 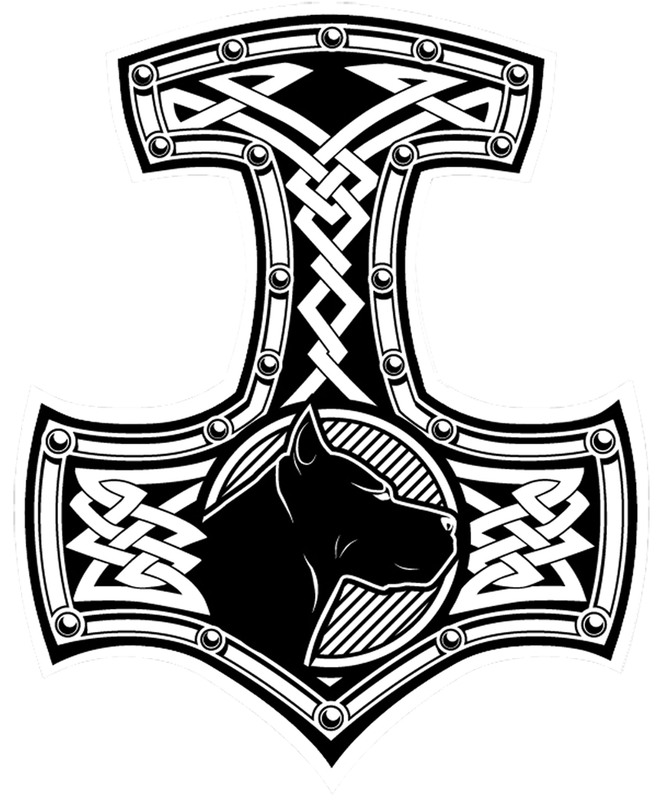 The danger of a man fighting a dog isn’t in the man’s speed or endurance. It’s in his ability to climb and use weapons. So a good protection dog needs to be able to jump high, something a tall dog can do well, and needs to be able to absorb a massive amount of damage before dying, something a well bred mastiff does very well. It’s also important to point out the differences in personal protection work and Police dog work. A police dog needs to be under 100 lbs, they need to be able to transport the dog easily and they need to be able to catch a man quickly but not kill him. They don’t have to be super tough because they always have armed police support nearby. Their job is to slow someone down and find them when human senses fail to. A PP dog may be the only line of defense. A 60 lb Malinois may make a great Police dog, but wouldn’t stand much chance alone against a 200 lb crack-head with a knife. A 150 lb dog who’s built right, and nothing but muscle and bone, would be a much smarter choice for anyone looking for a dog to protect their family while they’re away. A PP dog may be called on to kill a person threatening their family, and because of drugs, you can’t count on the person being afraid or reacting to pain. The dog will have to physically outmatch their attacker to survive and do their job. When it comes to Personal Protection and home protection size, toughness and power are equally as important as speed, endurance and maneuverability, especially if confronting multiple attackers. The dog must be a physically balanced athlete to reach his potential as a protection dog. David you have spoken a perfect intelligent truth. PP dogs are not Police dogs. And the selection process is different. Im am immensly impressed by your website ive been to dozens and have researched pp protection dogs and steps from all angles an your site by far is the simplest but most effective. please continue to educate us all. any notes on using thepitbull as a pp dog? As for pits as protection dogs. Game bred pits are some of the most prey and fight driven dogs on the planet, combine with the extremely high stimulus threshold and you get “game” dogs who will keep going to until they are destroyed physically. The can also be some of the most intense and naturally fit dogs anywhere. Unfortunately they don’t make realistic protection dogs. 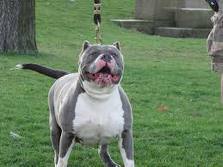 They lack the mass and strength needed, most game bred pitbulls are around 40 lbs. The bigger 100+ lbs pits are really bandogs. More important than a lack of mass is they usually lack defense drive and don’t have much interest in confronting a human. There are exceptions but it’s very unusual. Mechanically the little game dogs are great, as a result they have extraordinary movement and agility. Dog aggression is another big issue with pitbulls trying to work together doing guard and protection work. Most of those issues can be worked around and trained against, but in the end a small lightly built dog is just too easy for a man to kill. My Pit is a tall muscular type…he is not the small game type. He weighs 90lbs and I’ve yet to find a house dog as fast (42 top speed)…he can almost out wrestle my 6’1″ thirteen year old and is strong enough to break standard wood doors in a house, seriously. He also has an incredible jump height, I haven’t measured the standard woodfence, but I’m almost 6 foot and the fence is taller than I am …he can jump it. Playing with him is a real workout, but he’s a lover…he doesn’t like strangers getting into my personal space (closer than 2-3 feet) though. I think if the breed were standardized (Burger has champion lines back to the early 1900’s) to be like my “Burger” they would be excellent PP dogs. Pit Bull Terriers vary too much in size as a breed, just like you said, they are often too loyal and people oriented as well, but I think with the right selective breeding and training they could be perfect. I really love your blog, thanks for all the great information. 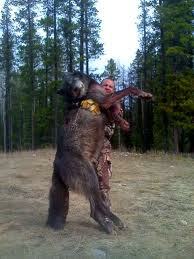 My housedog would outrun him in seconds, lol. He’s a Borzoi, though, & he’s been clocked at 50 mph. Your boy would definitely have more power, though. Correction, top speed ACCURATELY was 34…apologies. Very good article. 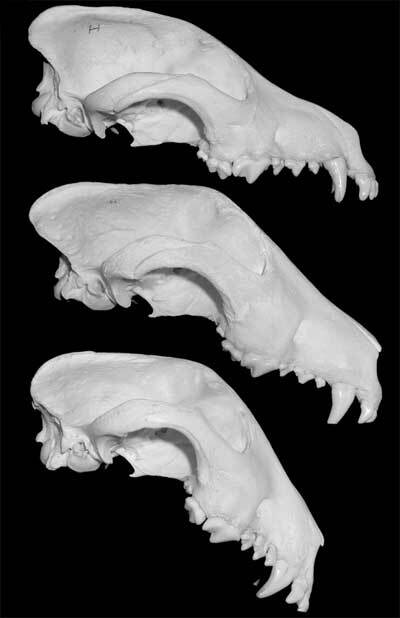 I especially like the discussion of skull shape & stop size. I have Central Asian Shepherds & I prefer them over their Caucasian Ovcharka cousins because they are more wolfish in shape, with longer legs & backs, more athletic bodies, & less boxy heads with a shallow stop. The massive, broad, deep heads of many modern-type Caucasians look very impressive, but offer no advantage in biting power over the more streamlined Central Asian head. Hurrah, that’s what I was seeking for, what a material! present here at this webpage, thanks admin of this web page. May i congratulate you on the excellent article, and common sense you are propogating on this website. You are right in saying more than one breed is slowly being destroyed by people’s desire for a dog to look a certain way, instead of being an animal capable of functioning in the state most beneficial to it. Are any of your dogs pets to you and your family? I have two children, and i have treated all my former dogs as family pets. 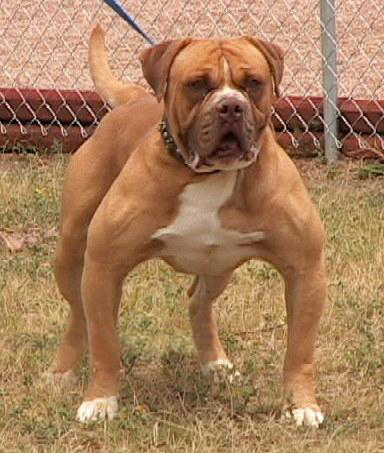 I need to be extremely cautious while selecting a big dog to be around my young boys. Do banddogs make good pets? Will they take with good humor, children playing with them, or using them as a pillow in front of the television. Or the kissing,hugging and invasion of personal space that comes along with children and a family?